I don’t know about other areas but down here in Appalachia, we have watch birds! They have a dual purpose on our farm…their favorite food to eat is ticks along with other bugs! Works for me! However, they are the UGLIEST birds you will ever meet – they ALWAYS look angry! 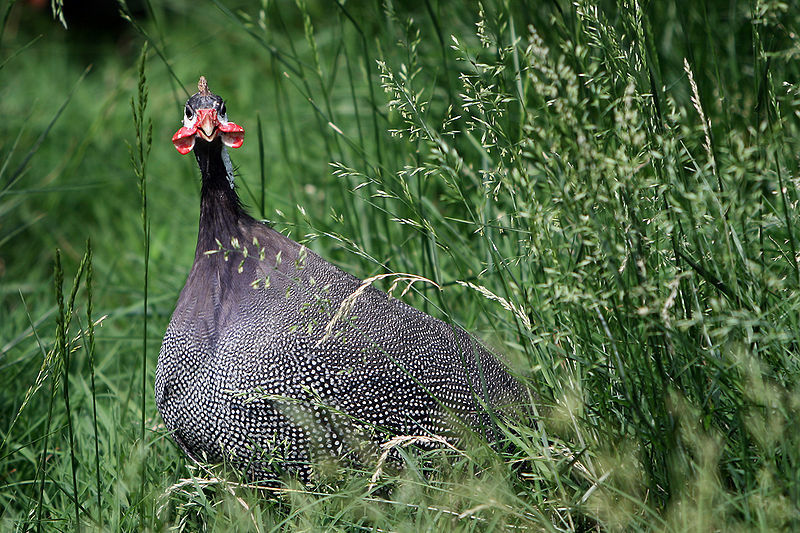 Not exactly a bird you want to cuddle up to…but, seriously, they are important to have around the homestead! Not only do they alert you to anything out of the ordinary on your property, they alarm at hawks, stray dogs, and anything else they think you need to know about. They are smart too. It’s hard to find a nest and if you do, and they know it, they will move that nest and it’s unlikely you will find it again. And…they are DARN expensive to buy! 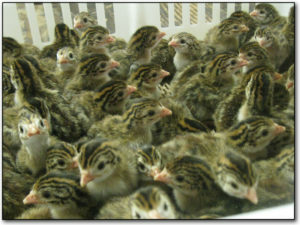 When winter started we had a healthy group of 9 guineas. By the time spring arrived this year, we were down to 2. Predators have been active this year. So, rather than purchase babies, which are incredibly cute by the way…just look how they start out, they make me think of chipmunks! We raise our own. 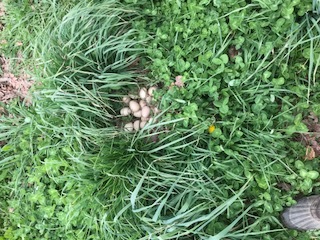 We found this nest of guinea eggs about 10 yards from our chicken coop. Guineas have a community nest and take turns sitting on the eggs. These would have been hard to find if the wind hadn’t been blowing just right. Now, we scoop them up and incubate them ourselves. Elijah has figured out just how to do that so that we have a high hatch rate. We raise them until they are big enough to take flight for protection and then we turn them out to join the others. Sometimes it takes a little bit of time for the two groups of birds to join forces but usually they do. Guinea eggs are a bit different from a chicken egg – the shell is tear drop shaped, speckled and VERY hard. The first time we found one in the coop, we didn’t notice it was different. I was trying to crack that baby open and I remember yelling at the boys to stop feeding the chickens so much oyster shell! Then I figured it out! On the inside, they look, and taste, just like an egg from one of your hens. Their feathers are valued by those who like to tie their own flies for fishing. I’ve given handfuls away to friends over the years. 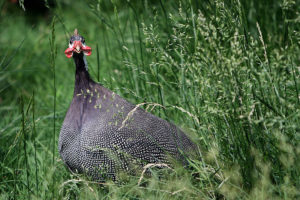 You can eat guinea hens also – they are an all dark meat bird. I must confess we’ve never harvested one although we harvest plenty of our own hens. Perhaps they are much more valuable to us keeping the bug population down, letting us know when a stranger or predator has arrived and perhaps…they are just too darn ugly to eat. We love our 3 guineas. They’ve lasted longer than previous ones. I don’t know if they’re females or males but a grandy found some eggs the other day that looked like theirs. I’m glad I found your website. I followed you many years ago. I have a printed out copy of your Basic Medicinal Herbs from awhile back. Sounds like things turned out well and happy for you. So happy for you. Blessings. Hi Karen! Welcome to my new “home”! So glad you found it. We are still polishing around the edges but I hope it will become a place full of information for people desiring to live a more natural life. So glad you found my Herbal Medicine book helpful….I’m thinking about expanding it…sounds like a great project for next winter!